As described in How Buffer works, an important feature of the Buffer tool is the Method parameter which determines how buffers are constructed. There are two basic methods for constructing buffers: Euclidean and geodesic. Euclidean buffers measure distance in a two-dimensional Cartesian plane, where straight-line or Euclidean distances are calculated between two points on a flat surface (the Cartesian plane). Euclidean buffers are the more common type of buffer and work well when analyzing distances around features in a projected coordinate system, which are concentrated in a relatively small area (such as one UTM zone). Your input features are dispersed (cover multiple UTM zones, large regions, or even the whole globe). The spatial reference (map projection) of your input features distorts distances in order to preserve other properties such as area. Geodesic buffers may appear unusual on a flat map, but when displayed on a globe, these buffers will look correct (you can also use the ArcGlobe or ArcGIS Earth applications to view geographic data on a three-dimensional globe). For more information, see How Buffer works. The Method parameter determines how buffers are created. Planar (method = "PLANAR" in Python) is the default option. This option will automatically determine which method to use based on the coordinate system of the Input Features. If the input features have a projected coordinate system, Euclidean buffers will be created. If the input features have a geographic coordinate system and you specify a Buffer Distance in linear units (meters, feet, and so forth, as opposed to angular units such as degrees), geodesic buffers will be created. This option produces the same result as the Buffer tool prior to ArcGIS 10.3. Geodesic (method = "GEODESIC" in Python) creates a shape-preserving geodesic buffer regardless of the input coordinate system. The shape-preserving geodesic buffer densifies the input features prior to creating the output geodesic buffers in order to create buffers that more closely represent the input features shape. If you are concerned about the shape of your buffers and how closely their shape matches the original input features, it is recommended you investigate using this option, particularly when your input data is in a geographic coordinate system. In some cases this may take more time than the geodesic buffer created using the Planar option, but the result is a buffer that more accurately matches the shape of the input feature. You can change the coordinate system of a feature class using the Project tool, or you can set the Output Coordinate System geoprocessing environment before executing the Buffer tool, and this coordinate system will be used in creating buffers. When using the Planar method, you can improve the accuracy of buffers created with projected inputs by using a projection that minimizes distance distortion, such as an Equidistant Conic or an Azimuthal Equidistant projection and is geographically appropriate for your input. When buffering features in a projected coordinate system with output to a geodatabase feature class, the geometries created may contain circular arc segments (when buffering points, the output will always be circular arcs). If buffers containing circular arcs are reprojected to a different coordinate system, the location and size of the original buffers will be transformed, but the shape of the buffers will not change, causing the reprojected buffers to no longer accurately represent the area covered by the original buffer. If you reproject buffers containing circular arcs, first use the Densify tool to convert circular arc segments to straight lines, and then reproject the densified buffers. The output feature class will have a BUFF_DIST field that contains the buffer distance used to buffer each feature in the linear unit of the input features' coordinate system. When using the Geodesic method for buffer creation, the buffer distance entered will be converted to Meters in all cases. If a field named BUFF_DIST exists in the input, its values will be overwritten in the output. If a Dissolve Type of All or List (ALL or LIST in Python) is used, the output will not have this field. The output feature class will have a ORIG_FID field that contains the feature ID of the input feature for which the buffer was created. If a field named ORIG_FID exists in the input, its values will be overwritten in the output. If a Dissolve Type of All or List is used, the output will not have this field. The Dissolve Field(s) parameter Add Field button is used only in ModelBuilder. In ModelBuilder, where the preceding tool has not been run or its derived data does not exist, the Dissolve Field(s) parameter may not be populated with field names. The Add Field button allows expected fields to be added to the Dissolve Field(s) list in order to complete the Buffer tool dialog box. Side Type (line_side) options Left, Right, and Outside only (LEFT, RIGHT, and OUTSIDE_ONLY in Python) and the End Type (line_end_type) option Flat (FLAT in Python) are only available with an Desktop Advanced license. The sides of the input features that will be buffered. FULL —For line input features, buffers will be generated on both sides of the line. For polygon input features, buffers will be generated around the polygon and will contain and overlap the area of the input features. For point input features, buffers will be generated around the point. This is the default. LEFT —For line input features, buffers will be generated on the topological left of the line. This option is not valid for polygon input features. RIGHT —For line input features, buffers will be generated on the topological right of the line. This option is not valid for polygon input features. OUTSIDE_ONLY —For polygon input features, buffers will be generated only outside the input polygon (the area inside the input polygon will be erased from the output buffer). This option is not valid for line input features. This optional parameter is not available with a Desktop Basic or Desktop Standard license. The shape of the buffer at the end of line input features. This parameter is not valid for polygon input features. ROUND —The ends of the buffer will be round, in the shape of a half circle. This is the default. FLAT —The ends of the buffer will be flat, or squared, and will end at the endpoint of the input line feature. Specifies the dissolve to be performed to remove buffer overlap. NONE —An individual buffer for each feature is maintained, regardless of overlap. This is the default. 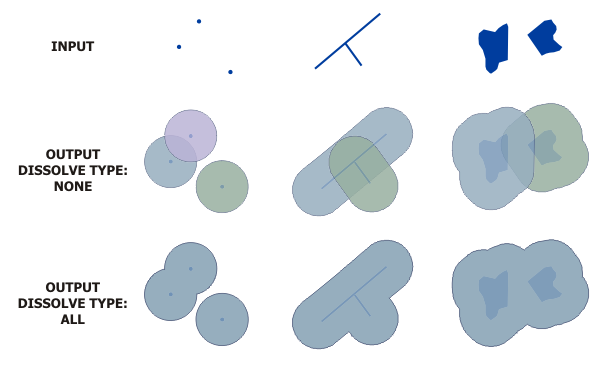 ALL —All buffers are dissolved together into a single feature, removing any overlap. LIST —Any buffers sharing attribute values in the listed fields (carried over from the input features) are dissolved. The list of fields from the input features on which to dissolve the output buffers. Any buffers sharing attribute values in the listed fields (carried over from the input features) are dissolved. Specifies what method to use, planar or geodesic, to create the buffer. PLANAR —If the input features are in a projected coordinate system, Euclidean buffers are created. If the input features are in a geographic coordinate system and the buffer distance is in linear units (meters, feet, and so forth, as opposed to angular units such as degrees), geodesic buffers are created. This is the default. You can use the Output Coordinate System environment setting to specify the coordinate system to use. For example, if your input features are in a projected coordinate system, you can set the environment to a geographic coordinate system in order to create geodesic buffers. GEODESIC —All buffers are created using a shape-preserving geodesic buffer method, regardless of input coordinate system. The following Python window script demonstrates how to use the Buffer tool. Find areas of suitable vegetation that exclude areas heavily impacted by major roads. whereClause = "HABITAT = 1"